Is anyone else having trouble getting their kids to concentrate already? We’ve hit this moment before where the excitement of the holidays makes school work impossible. I just don’t remember it happening so soon! I’m going to have to pull out all the stops with holiday themed work so we don’t lose ground in December! Luckily, there is plenty of holiday work to go around. 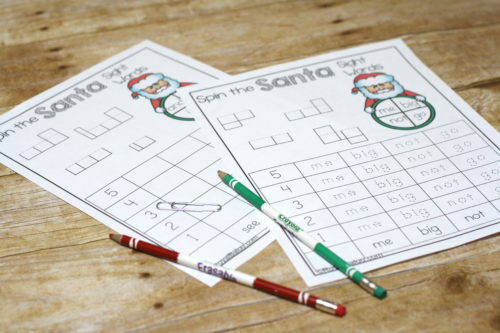 And I think these Santa Sight Word Spin It pages will be just the trick for my Logi-Bear (5). 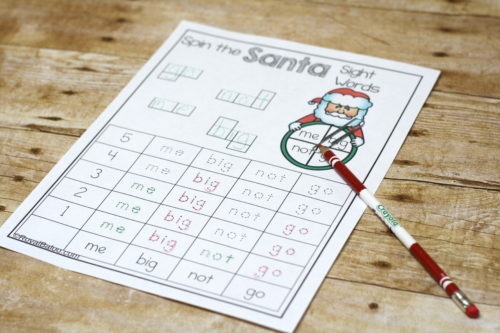 When Should You Start with Sight Words? This seems to be a great debate – sight words or phonics? I belong to the “both are great” camp and the “do what works best for you”. Baloo and Royal (10 & 7) both used phonics. It worked for them. They did a bit of sight word work as well but the main focus was on phonics. Logi-Bear is totally different. He has had a harder time memorizing his letter sounds so we’ve done a lot of sight word work. He wants to read and I don’t want him to feel discouraged. If that means we start with sight words, that’s fine with me! We are still going to get to phonics (on his timeline though, not mine). There are two versions of each page – one with the words to trace and one with a blank space. 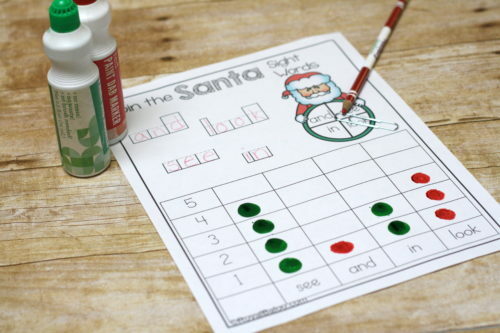 The blank space can be used with dot markers or for writing without tracing. Choose which page works for your child! Other than that, all you need are pencils (we love these erasable colored pencils because they’re so colorful but still erasable) and a paperclip. Using the pencil to hold the paperclip on the spinner, spin the paperclip. Mark the word you’ve spun on the graph.